The Heritage BC conference will be held in beautiful New Westminster. 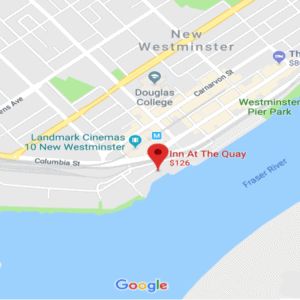 The majority of the conference will be held at the hotel “Inn at the Quay”. Do you have any restaurant recommendations in the area? A Waterfront restaurant that offers local, sustainable seafood, premium steaks plus wines from British Columbia. El Santo was recently awarded best Latin restaurant in Vancouver, by Vancouver Magazine. A Rustic modern Italian restaurant that serves delicious Italian cuisine. A modern spins on Chinese fare. I am travelling from out of town. What options are there to get to the conference regarding transportation? How do I travel in from the Airport? You will need to exit the Airport and go to the Skytrain station (located above the YVR parking lot). You will travel up the escalators and purchase a ticket. You will then enter the platform and look for the train titled CANADA LINE TO WATERFRONT. Enter the train and ride it until you reach the station Vancouver City Centre Station. The travel time from the airport to the Vancouver City Centre Station is roughly 20-25min. You will need to exit the Canada Line Sky train station by going up the escalator until you get to street level. You will then walk across the street until you get to Expo Line Skytrain station (located underneath “The Bay” department store. Enter the Skytrain and take the “EXPO LINE”. You will ride the train for 30min and get off at New Westminster Station.